Clianthus maximus - "Parrot's Beak"! 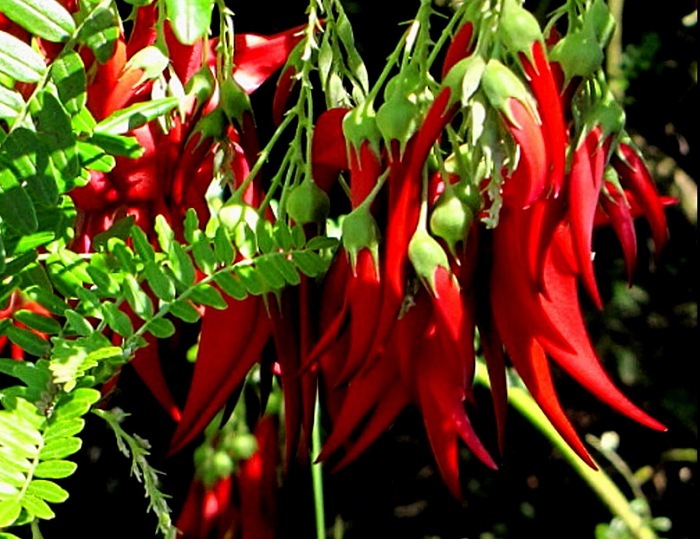 Clianthus maximus - "Parrot's Beak" - puts on an amazing show of blooms resembling tropical bird bills! 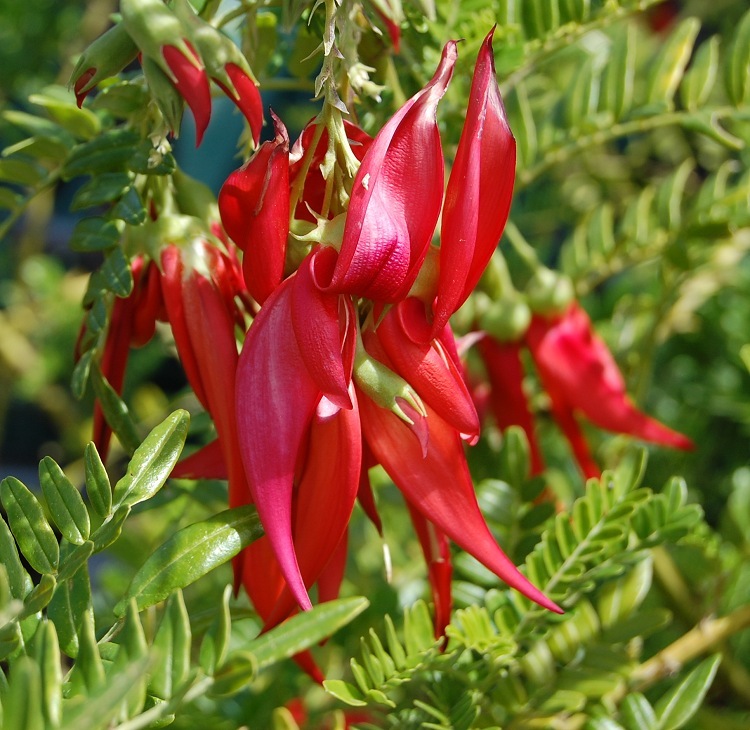 This unusual native of New Zealand gets loaded with big, scarlet blooms that dangle from attractive, fern-like foliage. 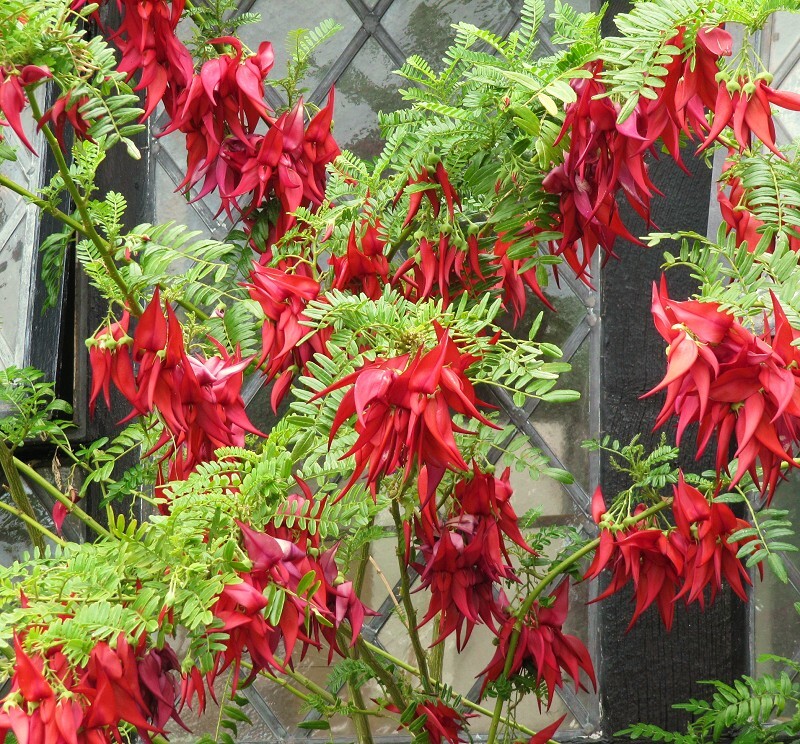 It's related to my much-loved Clianthus puniceus, except the blooms are larger and redder, and the foliage is nicely glossy instead of dull. This is an endangered species that is almost gone in the wild. It is equally rare in cultivation. I don't know anyone in the U.S. currently offering it. Parrot's Beak is an evergreen bush that usually grows 5 to 10 feet tall and wide, although it may be pruned to any size that's desired. The top surface of the leaves has a glossy sheen that makes them look wet. The plant can have some flowers on it throughout the year, but the main show is in spring and early summer, when the branches will bend downward from the weight of all the blooms! The exotic flowers are 3 inches long and have a thick, waxy texture, almost like they were carved from lipstick. It comes from a mild climate, where day temperatures are moderate and nights are cool but frost-free. I have no knowledge of how it will perform in hot weather. It's possible that it may decline if days regularly get above 85°F (29°C) and nights are above 65°F (18°C). It can probably survive a few degrees of frost, but i recommend keeping it from freezing. It likes a half-day of sun to full sun. Some afternoon shade might be needed in warmer conditions. It grows well in a pot in well-draining soil that's kept evenly moist. In the right conditions, it is easy to grow and quite vigorous.